President Trump’s “shithole” commentary on immigrants from unspecified Countries in Africa, as well as those from Haiti and El Salvador, may have taken the country by a storm, but the numbers from his administration are beginning to reflect that sentiment. 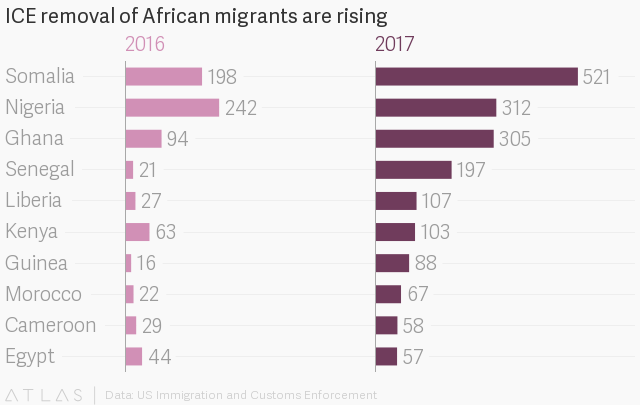 In the year after Trump took office, US Immigration and Customs Enforcement (ICE) has reported a drop in total number of overall “removals”—except for African migrants who have seen a spike in the number of people sent back home. Even though overall removals dropped to 226,119 in 2017 from 240,255 in 2016, the number rose for Africans—in many cases, more than doubling from the previous year. The fiscal year data runs to Oct. 5 in each year. For the top 10 African countries on ICE’s list, removals jumped by 140% to 1815 people removed in 2017, from 756 in 2016. Ironically, given Trump’s aggressive rhetoric about Mexico, the numbers of people sent back to Mexico and El Salvador dropped last year. The agency describes removals as “removals and returns initiated by ICE and those initiated by other agencies” which includes “Voluntary Returns, Voluntary Departures, and Withdrawals Under Docket Control” but doesn’t provide a breakdown of the categories under which the illegal migrants would have returned. The spike hit Somali communities the hardest, whose removals have more than doubled in the one year. Somalia was one of the six nations that came under what many say is a “Muslim ban” in January 2017—an executive order that temporary banned US entry to anyone from six Muslim-majority countries. Given many Somalis are often escaping conflict as it continues to be at the center of militant attacks—it reduces the likelihood of many voluntary returns. Libya and Sudan were the other African countries on the “ban” list but Somali migrants have come under numerous challenges since then, with many deported immigrants reporting abuse and maltreatment by ICE agents. Other countries whose nationals experienced a significant spike in removals are Senegal, with the number of people removed jumping more than nine times to 197 from 21 the previous year, while Gambian removals increased to 56 from 2 the previous year, Guinea’s rose to 88 from 16.